How to Get Rid of Carpenter Ants Effectively! How do you kill carpenter ants and keep them away? If you have a problem with ants nesting in your wooden structures you’ve come to the right place. You will find useful, real life experience of how to get rid of carpenter ants effectively. The info here is also applicable to many other insect pests like bed bugs, ticks, cockroaches, etc. and is based on considerable study and personal experience in killing bugs at home. A word of caution, be patient. It could take weeks to months to eradicate the problem. You can hire an exterminatore or if you prefer to DIY, I highly recommend using this carpenter ant control kit. Carpenter Ant Control Kit - dual action bait is doubly effective. Carpenter ants alternate between eating sugar and protein for weeks at a time. This makes any ant bait effective only 50% of the time. But this kit contains both a protein and a sugar based bait so it works all the time. Carpenter ants build nests in wood, hence the name. They do this by excavating wooden structures to create galleries and tunnels which makes them a pest when they decide to share your home! If that is the case, you can at least be thankful to have a carpenter ant instead of a termite infestation! Speaking of termites, you really want to determine whether you are dealing with termites or carpenter ants. Termites are far more terrible! They feed on wood and eat their way through much your furniture and wooden structures. Wood damage by termites happens much faster and is far more widespread than wood damage caused by carpenter ants. This is because carpenter ants do not eat wood, they only burrow through wooden objects to build a nest so the extent of damage caused is not as bad as termites. If you already know where the nest is, you can skip to the bottom and use a dusting product directly on the nest. If you don’t know where the ant nest is, do NOT spray insecticides on ants or ant trails! Spraying on carpenter ants when you spot them crawling around your house is akin to slapping a band aid on a gaping wound. All you will achieve is to kill a bunch of hapless worker ants. Ant colonies number in the thousands and you can be sure more will be back. So don’t be lulled into thinking you have won the battle when you have killed a dozen workers. You might be making things worse in the long run. Like the Lernean Hydra in the ancient legends of Hercules which sprouted two heads for every one that was destroyed, as long as the queen ant is alive, their numbers will keep multiplying. Worse still, if your spraying is deemed a threat to the existing nest, it could trigger the colony to start “satellite” nests. This is when several hundred or thousand ants are sent out so establish other nests. This can lead to increased reproduction and you will end up with more ants and worse still multiple nests which means more damaged wood articles and more ant nests to deal with! Talk about double trouble! There are several steps to effectively get rid of carpenter ants. The steps here can also be applied to get rid of ants in general. It requires a little patience to positively identify the ants (as not termites), set out bait, track the ant trail to uncover the nest and finally a strategic strike aimed at eliminating the queen. Sounds like a Navy Seal operation! The task can be challenging and depending on your patience, extent of infestation (there might be one or multiple nests), how accessible the nest(s) are and your access to appropriate insecticidal treatments and baits. If you find the steps below overwhelming or still can’t get rid of the carpenter ants after going through them, don’t feel bad about getting professional pest control. It is always better to deal with this problem sooner rather than later when damage to the wood becomes more extensive and consequently more expensive to repair or replace. For ant nests indoors, here are the steps you can take to get rid of them permanently. A carpenter ant on a piece of wood. If you find wood damage, there are two prime suspects. It is important to then identify whether your have a problem with carpenters ants or termites. Carpenter ants have dark colored bodies, narrow waists, and bent antennae. If you spot one with wings, you can also positively differentiate it if the hind or rear wings are shorter than the front wings. In the case of termites, both their pairs of wings are about the same size, they have light colored bodies, thick waists and straight antennae. For more details see the post detailing differences between carpenter ants and termites. There are two main methods to get rid of carpenter ants. Method one is a Trojan Horse strategy where slow acting toxic bait is placed along ant trails. This bait is then carried back to the nest where it is distributed around before the slow-acting toxin kicks in. Method two involves locating and taking direct action on the ant nest such as Drione or Delta dust. Carpenter ants (and ants in general) eat any source of protein or sugar. They do NOT eat wood. Their diet ranges from insects, dead or alive, to any food left on the kitchen counter or table. A favorite food is honeydew, a sweet liquid produced by aphids which live on plants. 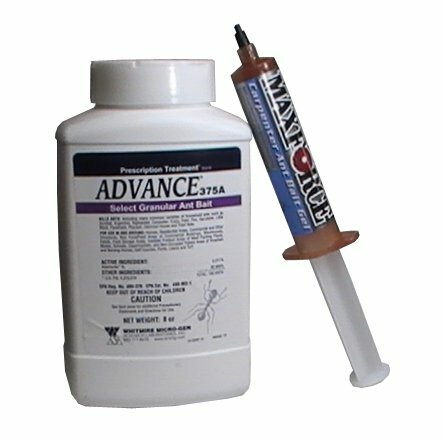 To locate an ant nest, prepare a simple bait with a spoonful of sugar stirred into a spoonful of milk (this bait contains both protein and sugar the importance of which is explained below as the reason for recommending Maxforce Carpenter Ant Control Kit) and left in spots where you often see ant trails. Then wait patiently till the ants show up. Tail the ant trail and find the nest! Once you think you have found the carpenter ants’ nest, here are some things you can do to double check it. Firstly, it should be made of wood. Duh! Also check especially in areas where the wood is exposed to moisture such as as roofs, timber decks or porches. These are common nesting spots as moist wood is softer and hence easier to excavate plus a carpenter ant queen prefers to live in a humid environment which helps to prevent her eggs from drying out. If you find a nest in a dry wood area, it is likely to be a satellite nest as these do not require moisture since there is no queen with her eggs. If so keep baiting and trailing to find the queen’s lair. Secondly, look and listen for signs of carpenter ant carpentry. Look for frass. This is the sawdust from burrowing that carpenter ants leave outside their nest. Remember they don’t eat the wood, just excavate it to make living quarter. So the excavated wood is dumped outside the nest. Listen for carpenter ants. If you suspect the nest is in a wooden structure such as a door or floorboards but can’t visually confirm it, here’s what you can do. Place your ear on the surface and knock on it with a hard object like the handle of a screwdriver or a spoon. If there is a colony living inside, this disturbance will cause the ants to make a scratching sound against the wood with their mandibles. Here are the two methods that can be used – poisoned baits and non-repellent insecticidal spray or desiccants. Once the ants have taken the bait, allow 3 days for it to be distributed in the colony. Meanwhile tail the ants and locate the nest if possible. If you have located the nest, dust it thoroughly with one of the 4 dusting products below. Don’t buy all four, just pick ONE! Your choice depends on how toxic a substance you are willing to use. Baits are particularly useful in situations where the nest is hard to access and the only way to access the enemy’s stronghold is with a Trojan Horse. The two keys to an effective bait are that it must be attractive to the ants and the toxin must be slow acting. The first key is so the ants will take the bait in the first place. Therefore do not just spray retail insecticide or repellent on the bait as that would render it useless. The second key is to ensure that the toxin in the bait is slow acting enough to allow the bait to be brought back to the nest and shared with the colony. Killing them slowly enables you to kill not just the ants you see but the thousands you don’t. Carpenter ants feed communally so the toxin has to be effective to kill them yet slow acting enough to delay this effect for days or even weeks to allow for the toxic bait to be spread to the entire colony and especially the queen. I strongly recommend the following Carpenter Ant Control Kit which has both protein and sugar based baits. You can read the review here. It has been observed that carpenter ants switch between a diet of protein and sugar exclusively for weeks at a time. Since many baits are either sugar or protein based, they might appear to work or not work depending on the ants’ dietary preference at them time. This is where the Maxforce Carpenter Ant Control Kit is especially useful. The granular Advance Carpenter Ant Bait is protein based while the Maxforce Carpenter Ant Bait Gel is sugar based so you will be appropriately armed whatever the season. Dusting is effective for situations where the ant nest is exposed or easily accessible. In cases where you have pinpointed and can deal directly with a nest, applying direct action is a fast and feasible kill method. The natural, non-toxic method can be found at How to Get Rid of Carpenter Ants Naturally using diatomaceous earth. The other option is using insecticidal dusts such as Drione Dust or Delta Dust which will be faster. Active Ingredients Diatomaceous Earth aka DE is a type of amorphous silica gel. 1% Pyrethrin, a natural insecticidal neurotoxin from chrysanthemum flowers. 40% Amorphous Silica Gel 0.05% Deltamethrin, a synthetic pyrethrin which lasts longer than biodegradable drione dust. Remarks Non-toxic. Natural, slower acting, mechanical killing action only. Moderate neurotoxin combined with some mechanical killing action. Highly effective neurotoxin combined with mechanical killing action. Can pose health risk to unborn and young children under 36 months old. Similar to Drione but is a synthetic insecticidal dust that has longer lasting effect (6-8 months). Get listed in an internet directory for free! Where you can find more resources about Pest Control. Was this helpful? Your +1 is appreciated!